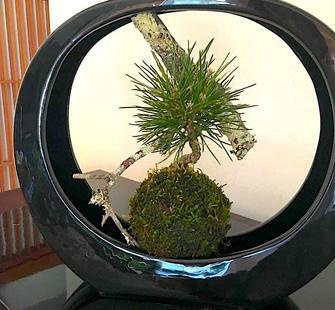 Kokedama is a style of simple Japanese Bonsai in which a plant’s root is wrapped in moss and bound by threads (Koke “means” moss and dama means “ball”). This simple sculptural art form, made by a miniature Bonsai tree and moss, encapsulate the Japanese aesthetic of Wabi-sabi, which is often explained as an appreciation of the imperfections of nature and the transience of natural beauty. This fascinating workshop includes instruction on the art form as well as hands-on participation by making your own arrangement.